The Paris Feast: Fizzy Fraise : Clairette de Die to refresh your summers. Fizzy Fraise : Clairette de Die to refresh your summers. Summer is usually about brunch and barbeque parties with the sun and the most usual requirement for such summer parties is refreshing oneself and keeping the energy flowing. Sangria is one such common and rather clichéd refreshments with wine and fruits. But how about a bit of change, a refreshing fruity drink to kick off the summers, but a bit uncommon and purely going French with it. Speaking for myself, I prefer white wine to red in the summers, mainly when the wine is chilled. So here is a drink made with a typical French sparkling white wine called the Clairette de Die. Clairette de Die is a natural sparkling wine from the Rhone Valley of southern France and is made from the Muscat Blanc a Petit Grains (75% minimum) and Clairette (25% maximum) grape varieties. The method of making it has been known since the Roman era and possibly originated around the town of Die where the fermentation of wine was interrupted by immersing the jars of wine in the frozen Drome river and leaving them for the winter. This made the wine sweet and gave its characteristic taste. Modern Clairette de Die is made by regulating the temperature of the wine in its bottle and thus preventing the sugar content of the grapes to be transformed to alcohol. The sparkling wine thus develops its fizz and sweetness in the bottle itself. It is characterized by its peach and apricot flavors and rose and honey suckle aromas. It is usually drunk young at a maximum of two years and served chilled at a temperature of 6°C to 8°C as an aperitif or sometimes to accompany a meal. The drink that I made and I advise if you are looking for a chic alternative to the sangria, is a fresh aperitif with strawberries and cherries. It has mild sweet and fruity notes which is the signature of the Muscat grapes and slightly aromatic which owes to the Clairette grapes. Here is the simple procedure to make this drink for your next brunch or BBQ party. First slice a handful of strawberries and remove the stalks from the cherries. Take a glass jug or carafe as we call it in France and place the sliced strawberries and cherries in the carafe. Pour the chilled Clairette de Die in the carafe. Here is a video to help you experience the chill and freshness of the drink. Seal the mouth of the carafe with an aluminum foil and place it in the refrigerator for 30 minutes. Take it out and serve it chilled in a long stemmed champagne glass. Enjoy beating the summer with this French specialty. This is incredible! 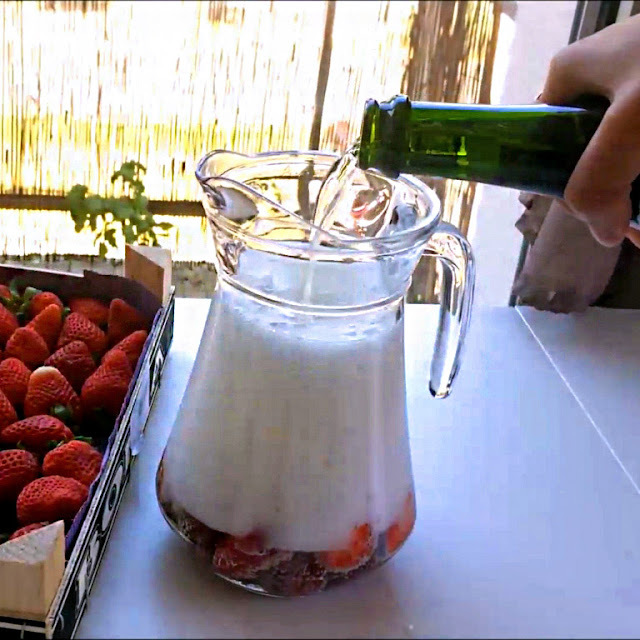 Incredibly mean to post something as great as champagne with strawberries when people are sitting at work like me without any rest :) just kidding :) I think I will keep this awesome idea in mind when I take a day off. Thanks a lot! Oh wow! lovely post. I'm truly cheerful to have gone by this site. Looks so delicious. I think its a great drink for this summer.The pics are all Fab!. Thanks for sharing this. Looking forward for more excellent post.